It’s two weeks to the Soldiering On Awards. This champagne-fuelled, glitzy evening will celebrate the best of inspirational people, charities and organisations within the military family. Someone decided that each finalist is worthy of public recognition and a shiny golden trophy, and the excitement to find out who has won is mounting. Last week, two of my colleagues from the charity invited me to an amazing lunch – choosing the menu for the awards dinner! As you may already know from previous blogs (or from eating out with me) I have a healthy appetite. But I have to admit that, on this occasion, the food actually beat me. We enjoyed the equivalent of 19 tasting courses – along with four glasses of wine! Then on Friday I was invited to a Women in Business event held by Newham Chamber of Commerce at the snazzy offices of Freshfields law firm in the city. This wonderful morning celebrated International Women’s Day (which was actually two days previous to that, but we’re worth celebrating every day, right?!) This year’s theme: Be Bold for Change. 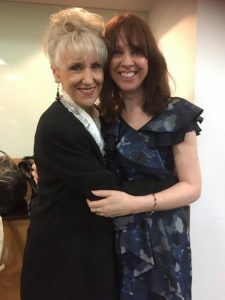 Rather than eat the breakfast (which did look delicious but was too early for me; I had to get up at 5,30 to be there on time), I spent the first hour or so chatting with Anita Dobson. What a lovely lady! I’ve seen her act, obviously, and in real life she was a delight to spend time with. Both being eastenders, (you see what I did there?) we chatted about days gone by spent at the Ilford Palais, the perils of getting older, such as reading menus at arms’ length, and our shared love of cats. This led on to a chat about animal charities, and I invited her to the Soldiering On Awards, as one category is for a remarkable animal that’s served in the military or worked as part of the military family. I hope she can make it. Following the breakfast and networking, the morning was a panel discussion of eight super-interesting women hosted by newsreader Julie Etchingham. She’s an incredibly smart lady who flawlessly directed questions at the panel members for an hour. While most people were impressed with me meeting celebrities, Gill was more excited that I’d also met the founder of her ‘Clubbercise’ class! Claire Burlison Green has built a global business from women exercising to disco music waving glow sticks in the air. She brought a couple with her for demonstration purposes, but didn’t hand them out to the audience, sadly. It would have been fun on the underground at rush hour. “Let’s sway, while colour lights up your face. Let’s sway – sway through the crowd to an empty space.” While Bowie was singing that – or the people in the 80s band were, we had no idea that 30 years later the crowds would have moved online and social media would fill all the empty spaces. Are you filling yours? 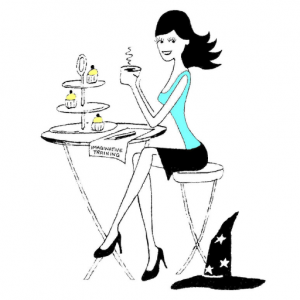 I’m around this week if you need any help – here I am: @WeekendWitch.